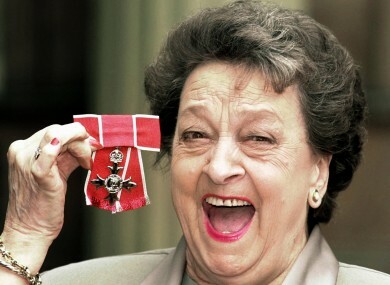 Actress Betty Driver - famed for her role in Coronation Street, and her character's famous Hot Pot - picks up her OBE in 1999. CORONATION STREET ACTRESS Betty Driver – better known as long-serving barmaid Betty Turpin, later Williams – has died at the age of 91. Driver’s death was confirmed by a spokesperson for ITV, who said she had died “peacefully at hospital” in the early hours of this morning. She had been in hospital for around six weeks, the Daily Telegraph said. She had been unwell earlier this year, and had suffered from a chest infection last year. Driver had originally joined the staff at the Rovers Return in 1969, initially on what was intended to be a three-month contract – but never left the show, spending a total of 42 years on the world’s longest-running soap. She had worked in entertainment long before her move to Corrie, however, beginning her professional life as a singer from the age of 8. She became a well-known big band singer and film actress in the 1940s. She first became involved in Corrie when she auditioned for the role of Hilda Ogden – and, having been rejected from the role, was instead cast in a sitcom spinoff of Corrie called ‘Pardon the Expression’. Driver sustained a back injury while filming the show, however, and retired from showbusiness to run a pub with her sister – only to be reluctantly coaxed back into showbiz in 1969 to take the role she became most famous for. Her best-known contribution to Weatherfield cuisine – her famous Hot Pot of lamb, potato, onion and Worcestershire sauce – became such a cult hit that it even became a popular supermarket ready meal. Oddly enough, however, Driver never tasted her own famous dish – because she was a a vegetarian. Actress Julie Goodyear – who played Rovers Return landlady Bet Lynch for over two decades – said Driver would be “missed and remembered by millions”. Email “Beloved Corrie actress Betty Driver dies at 91”. Feedback on “Beloved Corrie actress Betty Driver dies at 91”.